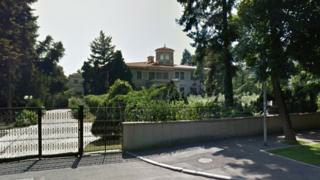 The opulent former residence of Romania's former leader Nicolae Ceausescu is to open its doors to visitors. It's been a quarter of a century since deposed Romanian president Ceausescu and his wife Elena were executed by a firing squad on Christmas Day in 1989, but ordinary Romanians will soon be able to see the mansion where the couple once lived, Balkan Insight reports. The luxurious building - dubbed the Primaverii (Spring) Palace - is set to open its doors to the public for the first time this Saturday. For as little as 15 lei ($4, £2.50), visitors will now be able to roam the 80-room residence - said to include a cinema, a swimming pool and an impressive dressing room - set in 14,000 sq m (3.5 acres) of grounds in Bucharest's desirable Primaverii neighbourhood, the Active News website says. It was designed in the mid-1960s to the exact specifications of the former dictator and his wife, who reportedly personally picked the chandeliers and mosaics. After the 1989 Romanian revolution which deposed Ceausescu, the building was taken over by the state and only rarely used to host official delegations. It was put up for sale in 2014 but attracted no buyer. Last month, the Palace of the Parliament - another massive building built on the orders of the former dictator - opened its doors to virtual tours. With 1,000 rooms, which were once the workplace of 100,000 people in the last days of the Communist era, it is both admired and reviled by the Romanian people. The revival of interest in the Communist era and an apparent softening of attitudes towards the once-hated regime comes at a time when many Romanians feel that life has not improved much since Ceausescu's overthrow, Balkan Insight says.